BD Vacutainer Safety Lok Blood Collection Sets allow caregivers to collect samples with minimized risk of needle exposure. After collecting samples, a yellow transparent shield can be adjusted over the needle and locked into position. This protects both the patient and caregiver from injury, such as needle-stick. To help with insertion, blood flashback can be seen through the shield, confirming that the needle is in the vein. Also, the large, flexible wings provide greater control while positioning the needle making one-handed application easier. The Vacutainer Safety Lok allows for collecting samples in a closed system with the integrated multiple sample luer adapter. This creates a sterile environment to ensure accurate samples. Make sure you have enough collection tubes like Vacutainer Serum Tubes when collecting multiple samples. BD Safety Lok Blood Collection Set requires No assembly. It is ready to use the moment you open it. This saves time for the patient and the caregiver. The collection set can also be used to administer fluids short term. The patient experience is more important every day. Patients are transforming healthcare one opinion at a time. How patients feel about the treatment they receive can be as important as their clinical outcomes. Many treatments can be difficult to endure so care providers are doing everything they can to make patients feel more comfortable. Minimizing discomfort is key to the patient experience and satisfaction. Care providers don't get a second chance to make a good first impression and that first impression is often a blood draw. Even patients with challenging venous access expect a successful stick the first time. That's what busy healthcare workers want too. Healthcare workers also want to feel safe as they take care of patients. The latest technological advancements from BD a leader in cannula technology and blood collection add up to an unparallel patient and healthcare worker experience. The innovative BD Vacutainer UltraTouch Push Button Blood Collection Set is designed to minimize discomfort. 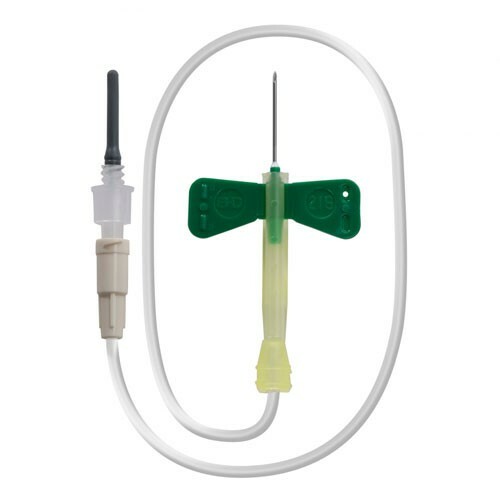 An exclusive ultra thin wall cannula allows healthcare workers to use smaller gauges for easier access to difficult veins without sacrificing sample quality or tube fill time. Last but not least, it has proven push button safety technology, which is great news for every healthcare worker. It's time to draw a new experience. An experience that minimizes discomfort and improves venipuncture every time. Patients and healthcare workers agree. The BD Vacutainer UltraTouch Push Button Blood Collection Set. We have a patient who is allergic to nickel. We need to know what type of metal is used in the production of your needles. The manufacturer states this item does not contain any nickel. I love these, they are easy to use. Lets blood flow quickly so you aren't in the patients arm for a long time. I have lots of clients say how painless they are.